Dip-Flux Feeder picks up component from waffle tray, stick feeder, or tape feeder, then dips component, leads, or BGA balls into rotating flux bath. It then places component or flip chip onto board or substrate. Fixed squeegee in rotating flux bath ensures constant flux wave height. Laser sensors detect approaching components and halt squeegee rotation for duration of dipping process. Feeder is not fixed-mounted and can be added to or removed from pick and place machine. Irvine, California, USA -- The new Dip-Flux Feeder from MIMOT facilitates Flip Chip assembly by accurately and precisely fluxing Flip Chips and other component types prior to placement. 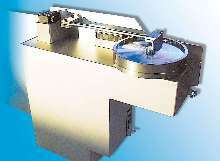 The unique MIMOT Dip-Flux Feeder picks up a component from either a Waffle Tray, Stick Feeder or Tape Feeder, then dips the component, leads, or BGA balls it into the rotating flux bath; it then places the component or Flip Chip onto the board or substrate. The high accuracy of the MIMOT machine enables it to place pre-flipped Flip Chips. Component wetting occurs through precisely-controlled movement and materials control that ensures repeatability. A fixed squeegee in a rotating flux bath ensures constant flux wave height. Laser sensors detect approaching components and halt squeegee rotation for the duration of the dipping process. Flexible and easily retrofittable, the Dip-Flux Feeder is not fixed-mounted and can be easily added to or removed from any standard MIMOT Pick & Place machine. It can be located on any free feeder slot on the MIMOT placement machine and will be automatically recognized by the system. MIMOT is a global leader in flexible SMT placement equipment, with facilities in Europe, Asia, and the Americas. MIMOT has led the industry in flexible, accurate placement technology for over 25 years. For more information, visit www.mimot.com, or contact MIMOT North America at 16 Technology Drive, Suite 133, Irvine, California, 92618 USA; tel. (949) 727-4600, fax (949) 727-4687.